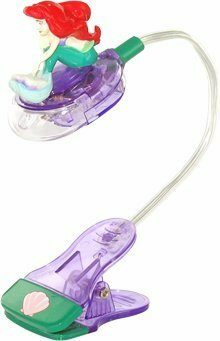 Little Mermaid Book Light Only $5.99 + FREE Prime Shipping! You are here: Home / Great Deals / Amazon Deals / Little Mermaid Book Light Only $5.99 + FREE Prime Shipping! I have a HOT deal for all of you with little princesses who love to read! Grab this fabulous Little Mermaid Book Light for just $5.99 (reg. $19.99)! And, you’ll get FREE shipping with Amazon Prime or Super Saver Shipping! My daughter LOVES Ariel, and she also LOVES to read, so this is the perfect gift for her! She will have a blast using it to read while she’s in bed before she falls asleep! Children will enjoy reading in a room with minimal light or in the dark with the Disney Little Mermaid Special Edition Book Light. The light includes a clip to place on your book so you can position it over the page you are reading featuring your favorite Disney Little Mermaid character. Perfect for: Reading in bed, students, traveling, auto passengers, computer light. Push character forward to activate the light.